Winter blues can only be cured by one thing, and that’s a winter warmer getaway. Relax and recharge at Webersburg Wine Estate. Our historic 1786 Cape Dutch homestead and boutique winery, is located on the slopes of the Helderberg Mountains in Stellenbosch which encompasses a relentless atmosphere that simply draws you in. This family owned estate, with a variety suites to choose from, is the perfect reason to enjoy a staycation this winter, if you reside in Cape Town. Locals and tourists can explore the Cape winelands in its wintery setting and find toasty wine tasting spots or guests can stay on the estate with the Webersburg boutique winery and wine tasting at your fingertips and our Bistro whipping out hearty winter dishes with a magnificent view of the dam and mountains, in front of you. There’s something quite comforting when good food and wine, on a cold winter’s day, is combined. The Manor house has two fireplaces to ensure guests are warm and cosy and the Owner’s Cottage is also furnished with a fireplace. The Jonkershuis, Owner’s Cottage and Vineyard Cottages are equipped with kitchenettes that include a microwave, fridge, toaster and stove as well as pots, pans, crockery and cutlery while the Manor House is fitted with its own swimming pool. Each suite combines contemporary and Cape Dutch style décor, together with an elegant touch. Webersburg is offering guests a winter accommodation special during the months of May to September. Book three nights and only pay for two! 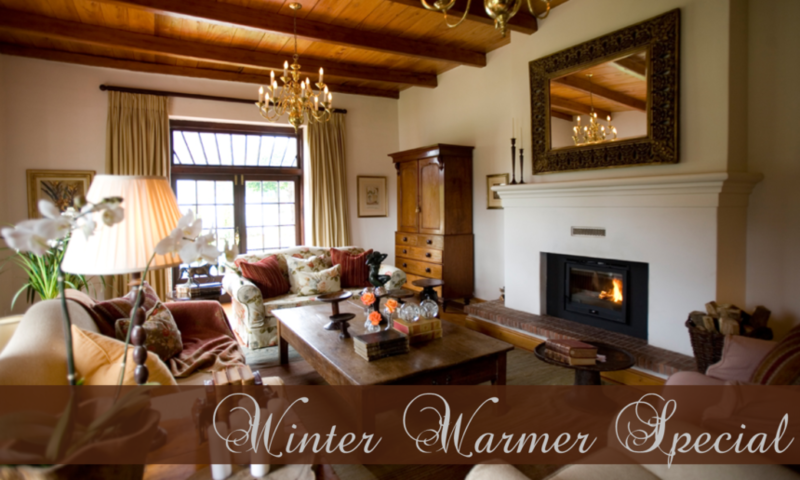 To book your winter getaway at Webersburg contact (0)21 881 3636 or email info@webersburg.co.za.